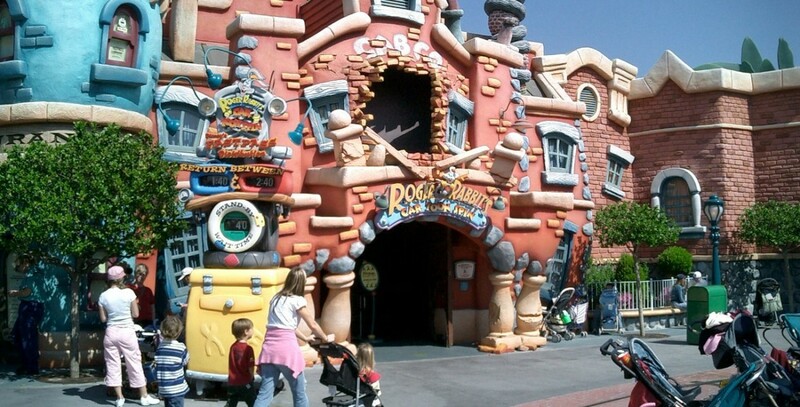 Roger Rabbit’s Car Toon Spin Attraction opened in Mickey’s Toontown at Disneyland on January 26, 1994. The first new dark ride built at Disneyland in a decade, Car Toon Spin takes guests in Lenny (not Benny) the Cab on a joyride through Roger’s milieu, with all sorts of intriguing effects. For the first time in a Disney dark ride, the rider can turn the steering wheel of the cab and change the direction in which the cab is pointing. For example, with a little effort, guests can go through much of the attraction backward if they so desire, and because of this, the designers had to create things to see in all directions. This attraction did not open until a year after the rest of Mickey’s Toontown. Also at Tokyo Disneyland; opened April 15, 1996.